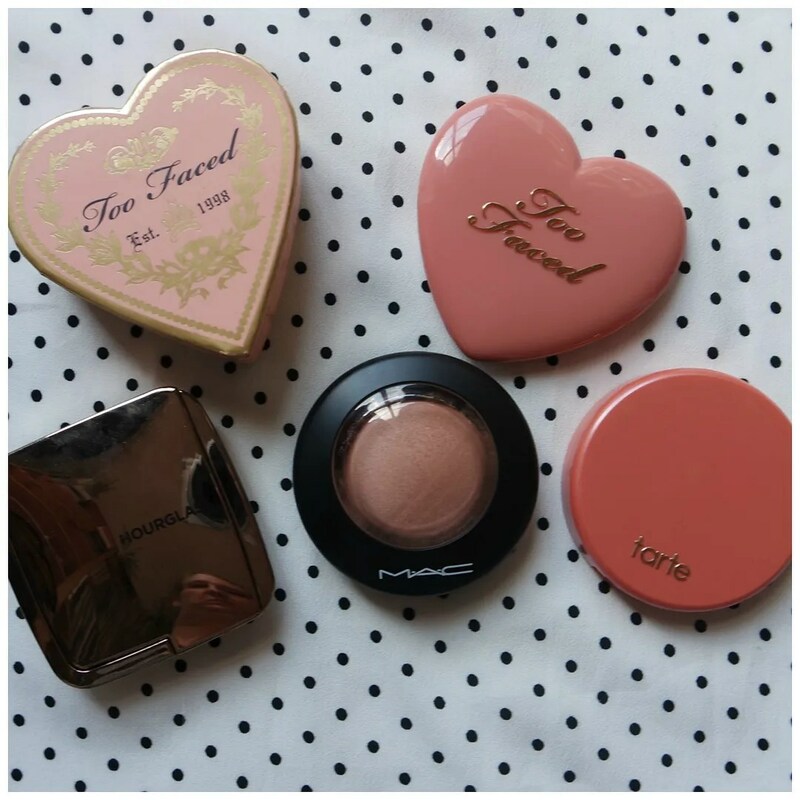 It’s been a while since I gave you an overview of my top 5 high end blushes. That is why today I will be doing just that! Blush wasn’t always my favorite makeup product, but it is a product that have I have come to love. And while the drugstore does some fabulous blushes as well, I reach for my high end ones the most. Which ones are they? Well, stay tuned, because that’s what this blog post is all about. 1 Too Faced Sweethearts Blush in Peach Beach – Peach Beach is the only truly shimmery blush in this selection. I am not a fan of shimmery blushes, but this is a welcome exception. I’m not sure what it is about this blush that makes me love it so much, just that I know I won’t have to use highlight when I use it. It’s a quick blush to use and super pretty on the cheek as well as universally flattering. A must have for sure! 2 Too Faced Love Flush Blush in Baby Love – You know I love neutral toned blushes. This is a brown toned pink that is super flattering on the cheeks. It has a bit of warmth to it but not too much which makes this a very versatile blush. This blush goes with everything and is pretty foolproof to use as well. Pigmentation is great, but blendability is where this blush truly shines. 3 Hourglass Ambient Lighting Blush in Mood Exposure – If I had to make a top 5 of my all time favorite blushes than this would be on that list. I love Mood Exposure and go back to it every fall/ winter season. This is very muted and more of a cooler toned blush as this is a mauve color. Since I have a neutral undertone, I can get away with everything, but this blush just always works no matter what. This is pigmented, but not overly so, which makes this very easy to use indeed. 4 MAC Mineralize Blush in Warm Soul – My newest blush on this list is Warm Soul by MAC. This is a cult favorite and for good reason. This is one of those blushes that looks very meh when you look at it, but on the cheek this is gorgeous. Again, it is a more neutral toned blush, which is what my preference goes out to. It is simply the easiest way of wearing blush and adding a bit of subtle color to the cheeks. As this is a Mineralized blush, this does have a little bit of glow to it, but it’s not shimmery like Peach Beach. 5 Tarte Amazonian Clay Blush in Achiote – The only bright blush on this list and that is because it really isn’t all this bright. This was my first Tarte blush and I finally caved after all the hype. I wasn’t convinced of these blushes at first as they look terrible in a swatch. But what everyone says is true: once on the cheek these blushes are gorgeous. I love Achiote as it is a peachy/ coral that is unique to my blush collection. What is your favorite high end blush?